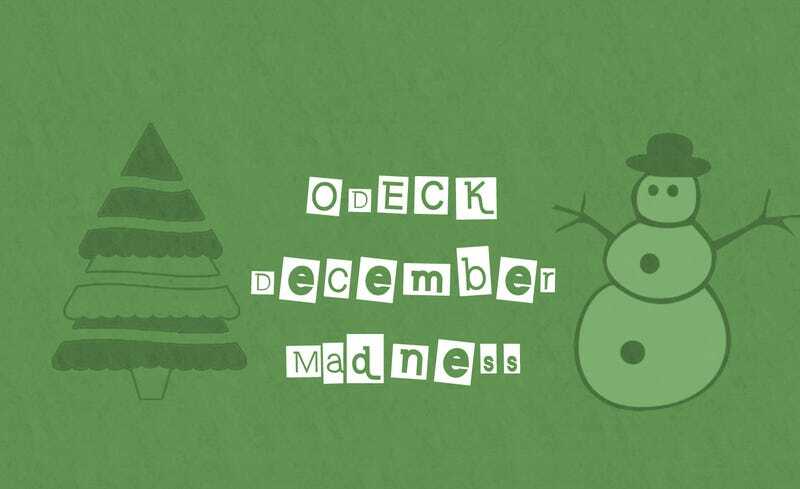 The first rounds have been completed, and we’re down to 32 competitors in the O-Deck’s December Madness. From here on out the decisions get harder, and the pain is more pronounced. Who will be upset today? In the last round of voting the favorites won every round but two. Garfield was unseated by everyone’s favorite snowman, Frosty. Clearly this is madness, but the voters have spoken. And Bad Santa was crushed thoroughly by #TeamScissors supporters. The Emo is strong with the voters this holiday season. As I mentioned above, from here on out the pain begins, and every match becomes tougher. Who is going to come out on top of the showdown between Miracle on 34th Street and It’s A Wonderful Life? MST3K vs Futurma? And will #TeamScissors overtake fans of the hilarious Trading Places? Voting ends at noon tomorrow, so we’ll have to wait to find out. Make sure you get your voting done in time. The more votes we get the more accurate our result. We’re all counting on you. Good luck.